Art-The artwork from Gerardo Sandoval is consistent from start to finish, I simply love it! Cover– This is yet another gorgeous rendering of the titular hero but this time with his mentor/teacher in the background. Mystery– Just who the hell is Mr. C really; Crazy old man, former superhero, former super villain? I simply must find out more! Black Hero/Characterization– Quinn continues to grow on me as his humor, the terrible situations in which he finds himself. He definitely channels classic Peter Parker and Virgil Hawkins in every possible way. Humour– I got a good healthy chuckle every time Mr. C deliberately called Quinn everything that was not Quincredible. Black Panther, Black Lightning etc, hilarious stuff! 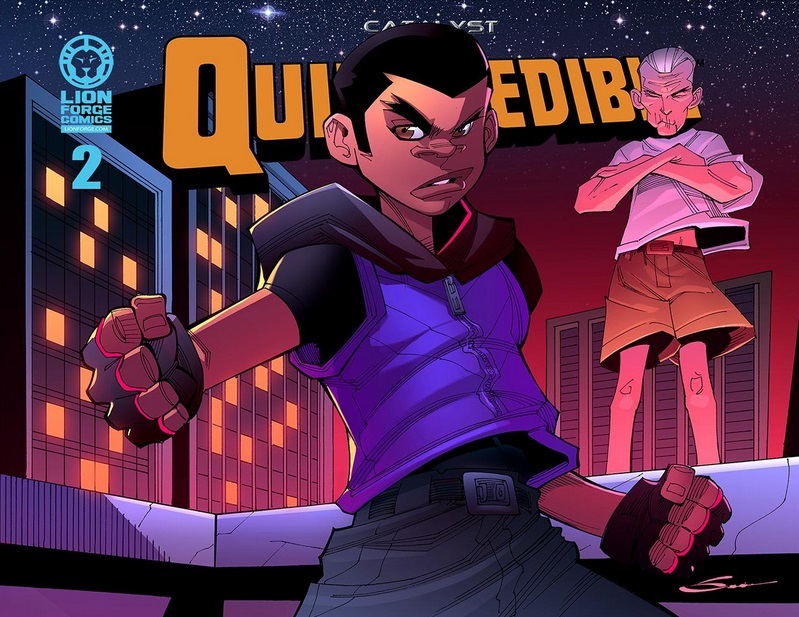 Put your money where your mouth is- Buy Quincredible #2 here! Brief– If you sneeze quite honestly the issue is over. Own or rent– This is a kindle book so for those used to reading digital comics it’s not really formatted to you on a traditional computer. I’m unaware of their being a physical copy either. Another issue with this book is that it doesn’t give you the ability to download the issue so technically you don’t own this book so much as you just spent 3.99 to rent viewing the book. That is BS to me! After what I payed I was at least expecting to be able to share the damn thing with my friends. That is not happening with Quincredible unfortunately!